Using anatomical microdissection, our group demonstrated that not only is it possible to excise and isolate nearly the entire adipose content of mammalian organisms, but also that BAT is wholly found in fat depots that are often prevalently white. In other words, in adult rodents kept in standard feeding and environmental conditions there are no totally brown depots distinct from WAT depots, but a single organ articulated into several subcutaneous and visceral depots containing both tissues . Fig.4. Adipose organ of an adult C57/BL mouse maintained in standard conditions. The organ is made up of two subcutaneous and several visceral depots. The most representative visceral depots are shown. Kidneys and testes were dissected together with the depots. 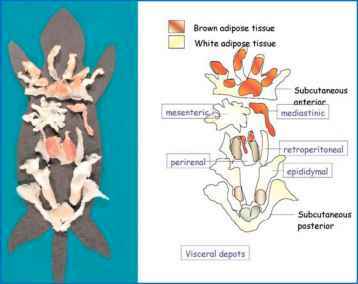 White areas made up of white adipose tissue and brown areas composed of brown adipose tissue are indicated by the scheme anatomical locations (Fig. 4). The anterior depot is the more complex; it lies at the base of the fore-limbs and mainly occupies the dorsal body region between and under the scapulae, the axillary and proximal regions of the forelimbs, and the cervical area. The interscapular is the most conspicuous central portion of the depot (body) and extends laterally (lateral wings) and anteriorly (anterior wings). The body is made up of WAT in its superficial portion, and of BAT in its depth. The latter extends to the lateral wings and to the subscapular and axillary regions (all brown), which in turn are continuous with the region occupying the proximal portion of the forelimb and the lateral thoracic wall (both white). The anterior wings extend anteriorly between the superficial dorsal muscles and reach the base of the neck. In this area, the anterior wings are often white, whereas the more anterior region following the course of the neck nerve-vascular bundle is generally brown. The posterior depot is located at the base of the hind legs. It is simpler, consisting of a single tissue band beginning from the dorsum at the lumbar level (dorso-lumbar portion), extending anteriorly in the inguino-crural region (inguinal portion) and further at the pubic level into the gluteal region (gluteal portion). At the pubic level this depot is continuous with the contralateral depot. The posterior depot is usually white. The visceral depots are located in the thorax and abdomen. The former lie prevalently against the intercostal nerve-vascular bundles, the heart and the aorta. They are usually mixed, but in constant environmental and feeding conditions much depends on age and species. The abdominal depots can be subdivided into retro- and intraperitoneal. The retroperitoneal depot par excellence has an elongated conical shape and lies in the paravertebral position, i.e. on the border between the spine and the posterior abdominal wall, and is generally white. The best known perirenal deposit is divided from the retroperitoneal by a peritoneal fold and can be dissected separately. It is generally mixed, with the brown component prevalently located at the level of the renal hilus. The omental deposit is small in rodents and is made up of WAT, as is the mesenteric depot out lined by the two peritoneal leaflets holding the intestine against the posterior abdominal wall. The perigonadal depot is consistently white and is simpler in males, where it is well circumscribed, enveloped and bound to the epididymis by the peritoneal leaflets. In females it surrounds the ovaries, uterus and bladder. Thus, in adult mice and rats maintained in standard conditions, the BAT component is macro-scopically visible in the sole anterior subcutaneous depot and in part of the thoracic and perirenal depots. However, light microscopic examination of WAT deposits shows the consistent presence of brown adipocytes, especially in the inguinal region of the anterior subcutaneous depot, in the perio-varian region of the gonadal depot, and in the retroperitoneal region. It is important to stress that the amount of brown adipocytes found in the different depots is genetically determined, since in similar environmental and feeding conditions it is substantially species-related . Subject age is also important in this respect. In a systematic study of the anterior subcutaneous depot in animals of different ages, we demonstrated that in ageing rats the BAT component undergoes a progressive substitution by WAT, albeit retaining a considerable size in older (2 years) animals [41, 42]. In general, the number of brown adipocytes tends to decrease with age in all depots. Minor WAT depots are found in bone marrow, parotid, parathyroid and pancreas. Different amounts of mixed adipose tissue are found along the vasculo-nervous bundles of the limbs, and close to the superficial lymph nodes the adipose tissue is often brown. How to isolate subcutaneous adipose tissue rat? What is inguinal fat on mouse? 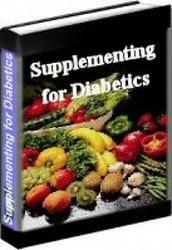 How to isolate perigonadal fat from mice? How to isolate subcutaneous fat from mice?